"I have been to a few chiropractors throughout my 60-some years of walking on this planet and this is, by far, THE BEST! I have read, researched and 'tried on for size' a number of chiropractors. Some are "you must see me 3 times a week for AT LEAST 2 years or you will be a cripple in that time"... uhhh , not so far. Others have done adjustments a couple times a week and nothing felt any different. Start with Jessica (great massage therapist) who chases knots and twisted muscles/tendons and such and smooths them out first, then it's off to see Dr Neal Wensink ( who readjusts all the various pieces/parts that have been knocked out of place by whatever life throws at you. If the spine is out of alignment (which is where your central nervous system lives and controls pretty much everything in body in one way or another) everything else is out of whack cuz the telephone lines in your body have all crossed signals. When you think everything is in order, it's off to see Chrissy (she's the Physical Therapist) to learn stretches and exercises that will help maintain all the wonderful work you just had done. WHY did I need this great team? I was rear ended by a semi-tractor trailer in my 20s which resulted in whiplash. Neck was never the same after that and therapy never lasts long enuf for that due to insurance cut offs. I was diagnosed with scoliosis (crooked spine ... mine due to a short leg... which wasn't discovered until a great deal of damage was already done). And what kid doesn't tumble and fall from things like skiing, ice skating, bike riding, horse back riding.... you get the pic. Try them... I'm sure you'll love them!" Thanks to Helen for the wonderful review she left on our Facebook page. 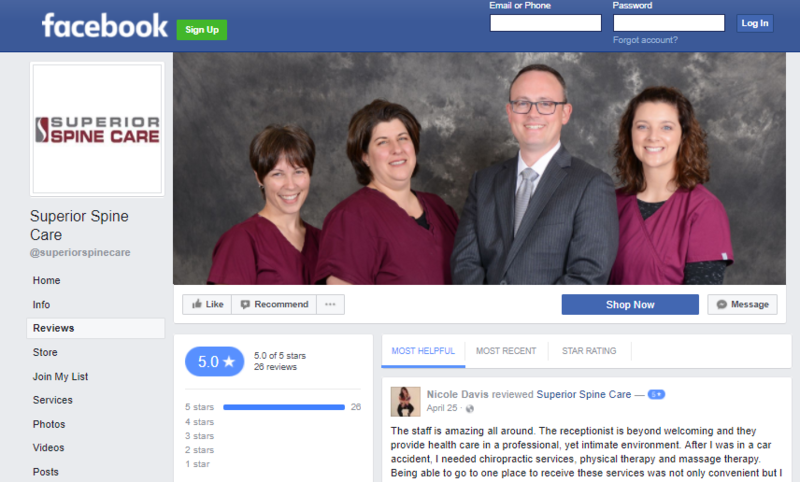 Click on the image of our Facebook reviews tab to see the review Helen in North Ridgeville, OH left for Superior Spine Care.